If you don't give over that envelope, you have no idea what's coming for you. One wonders at complaints of absurdity directed at a film like this, as if its title isn’t warning enough of what’s in store. 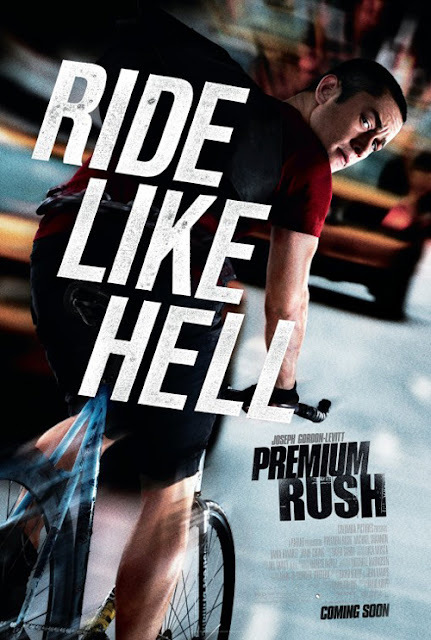 Premium Rush most definitely does not have believability high on the list of its priorities but, with plot and characters as amped up as its direction, if you’re willing to go with it this is a highly enjoyable, taut little thriller. For some reason, I get the CVs of writer-directors David Twohy and David Koepp confused. Twohy edges Koepp, perhaps because he has concentrated more on a directing career lately. He’s best known for the Riddick films, but I’d advise anyone to check out his deliriously OTT Hawaiian psycho thriller A Perfect Getaway for a real taste of what he can do. Koepp has proved less consistent. To a greater of lesser extent I've liked all his pictures (not so much Ghost Town), but ironically he’s tended to prove more proficient calling the shots than with his scripts. Premium Rush follows course; his work here (basically as an action movie director) is technically leaps and bounds beyond anything hitherto. The plot has Manhattan bike messenger Wilee (Joseph Gordon-Levitt), a cocky law school dropout who cycles hell-for-leather on his “fixie” (a brakeless bicycle with no freewheel), picks up an envelope that dirty cop Bobby Monday (Michael Shannon) wants to get his mitts on. But Wilee obeys the messenger creed and won’t turn it over to Monday. And thus a white-knuckle chase about the streets of NYC ensues, with Koepp flashing back to the whys and wherefores of the ticket and its would-be owner (the ticket is, essentially, a MacGuffin, and you’d be forgiven for not being absolutely clear on its details come end credits). Just the character names tell you that Koepp sees this in very much larger-than-life fashion. Wilee is more Road Runner than Coyote, the latter role delegated to Shannon’s ever-more confounded agent of destruction. And he’s called Bobby Monday! Bug-eyed Shannon can do this kind of crazed villainy in his sleep, and he’s hyperactively watchable; one could almost believe he took the role just for his final scene (well, that and a sizeable pay cheque). Koepp, clearly a geek, furnishes him with the pseudonym Forrest J Ackerman (a pre-eminent science fiction fan, collector and writer). Gordon-Levitt is as dependable as you'd expect; he may not be pushing himself in terms of the art but presumably the attraction was the physicality (obviously he had a stunt man for the more extreme stuff, but he’s in shot enough to make his endurance levels here most impressive). Dania Ramirez, as his cyclist squeeze, is sweatily delectable. The occasional cheesy touch (Wilee visualises alternate routes and their consequences) does nothing to lessen an adrenalised experience that brings to mind Point Break (but also, conversely, Phone Booth) in its upbeat embrace of extreme sports (extreme in the way Wilee approaches cycling anyway). David Sardy’s score is energetic, but perhaps not as honed or memorable as it could be. Koepp realises how slender this is, and inflates the running time with by jumping about with the timeframe. He’s unable to make the plight of the ticker owner anything other than crudely sentimental although, to be fair, it’s not as if over-statement isn’t the order of the day. The climactic cycling extravaganza might be a bit of silliness too far, but this a movie going for, and getting, a giddy grin, not a searching analysis.